Have you been feeling unusually run down and tired lately? Are you easily distracted and struggling to find the energy to complete simple daily tasks? While there are any number of conditions which might cause such fatigue, a common culprit is iron deficiency, also known as anemia. One of the most common nutritional deficiencies in the United States, iron deficiency affects more women than men, due to the fact that women regularly lose blood through their periods. Anemia happens when your body does not have enough iron to produce the necessary amount of hemoglobin – a vital component of red blood cells, which functions as a transportation system, spreading oxygen throughout your body. 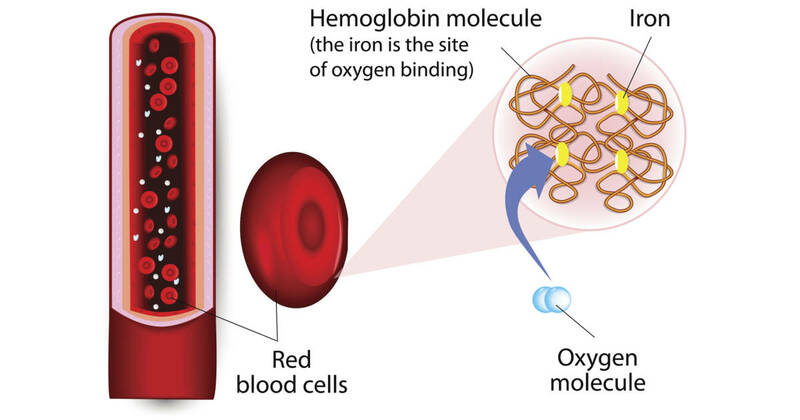 Without enough hemoglobin, your red blood cell count drops, and your body doesn’t get enough oxygen, leading to fatigue and shortness of breath. Iron deficiency isn’t always caused by a problem with your diet. Although some people are at risk for dietary iron deficiency – especially people who don’t eat meat or enough leafy greens. Iron deficiency can also be caused by blood loss, insufficient red blood cell production, surgery and certain medications, or a body’s inability to absorb iron(1). In these cases, iron supplements are often prescribed to help the anemic individual get their iron levels back up to where they need to be. Do you have the urge to chew on ice? What about a compulsion to consume dirt? If you’re experiencing either of these cravings, or cravings for other unusual substances like paper, you may have an iron deficiency. This symptom is known as pica, and it can be hard to catch – many people with pica are embarrassed to admit that they’re eating things that aren’t food. But for those who do report experiencing pica, iron supplements can help significantly (2). 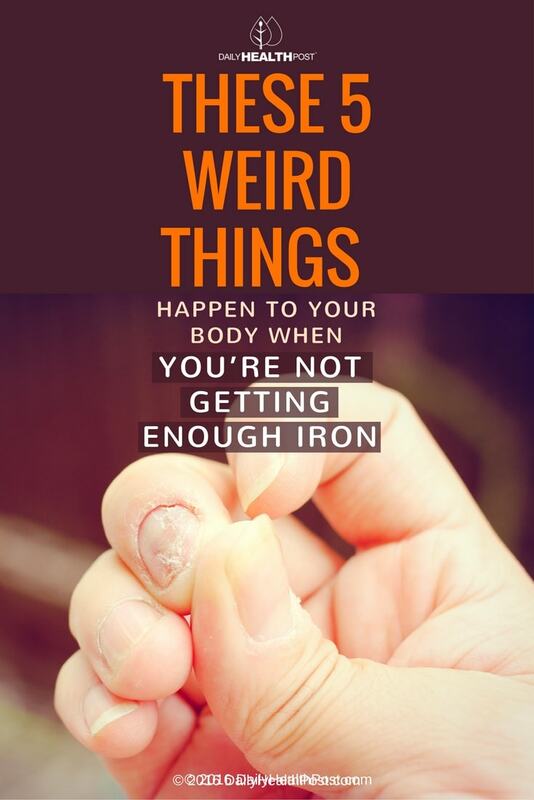 Ingrown nails, as well as unusually brittle and weak nails, are another early warning sign of iron deficiency. Although chapped lips can be caused by harsh weather, they can also be caused by iron deficiency. The difference between “normal” lip cracking – the kind that happens when you forget to put chapstick on during the harsh Winter months – and lip cracking due to iron deficiency is the location of the cracking. Iron deficiency causes cracking and chapping in the corners of the mouth, which can make it difficult to smile, laugh, or eat. This one is less obvious than other symptoms, but a swollen and unusually tender tongue can be a sign of anemia. If your tongue feels smooth rather than bumpy, and you’re having difficulty chewing, swallowing, or talking, it’s time to get your iron levels checked. Recent research has suggested a link between restless leg syndrome, a condition which causes a persistent tingling, tugging, or burning sensation in the legs, and iron deficiency(3). Although more research has yet to be done, it’s a good idea to get your iron levels checked if you’re diagnosed with restless leg syndrome. Iron deficiency is relatively easy to treat once it’s diagnosed. Most people do fine on iron supplements, which can be taken with vitamin C to prevent constipation. If you’re deficient because you’re not getting enough iron in your diet, make sure you’re incorporating lots of leafy green vegetables, fish, and whole grains into your meals.